Paula Boggs Band "Carnival Of Miracles"
We are willing to bet you’ve never met an artist quite like Paula Boggs. She is a proud veteran of the United States Army, where she earned Army Airborne wings and a Congressional appointment to the US Naval Academy. She is also a graduate of both the University of California Berkeley School of Law and Johns Hopkins University, and spent much of her professional life as Starbucks’ top lawyer. So how does this translate into a musical career? Boggs, a self-described unabashed patriot, has spent her life traveling the country and world – immersing herself in cultures, and getting enough inspiration to last a lifetime. She has been a singer/songwriter most of her life, and now feels compelled to share her keen observations about life, as well as her passion for music, with the world. 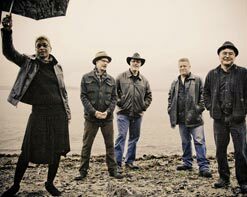 The Paula Boggs Band crafts a collaborative sound they describe as “soulgrass,” which is the swagger and emotion of soul mixed with the organic and genuine delivery of bluegrass and folk music. Her current album, Carnival of Miracles, produced by Grammy-winning Trina Shoemaker, is a perfect blend of energy and sparsity. Boggs weaves her soothing vocal delivery and the prolific musicianship of the band into a musical tapestry that tells a brilliant story – one that is relevant to the social & personal struggles that affect us every day. For her first single, “Carnival of Miracles,” she uses the tragedy at Newtown as her initial inspiration. She loves her country, and this sort of senseless tragedy cuts deep. But Boggs is one who knows how to harness the energy around her for the better. The song handles the issues delicately, but paints a poignant picture about how we can all find the silver linings in these moments and use them to grow and care for each other. The video itself is an absolute stunner. Shot in the hills of the Pacific Northwest, the band anchors the clip with their confident and soothing performance. The story of the video is inspired by the concept of “paying it forward.” A grumpy older man enters a diner, choosing to ignore a man who is apparently homeless and holding an “Anything Helps” sign out front. But when the grumpy man sits down in the diner, he opens his newspaper and sees a headline about a tragic school shooting. He is visibly affected and appears to have a change of heart when he helps a couple who are having trouble paying their diner bill. It’s an act of compassion that should inspire us all. His actions set off a small chain of events that lifts up everyone it touches. We are delighted to be working with the Paula Boggs Band, one of the most fiercely-talented and diverse artists we’ve discovered in a very long time. It would be our pleasure to hook you up with copies of the album, so please don’t hesitate to get in touch with us here at HIP Video Promo to put in your request. You can contact Andy Gesner and the HIP Video Promo staff at (732)-613-1779 or email us at info@HIPVideoPromo.com . You can also visit www.PaulaBoggsBand.net/ for more info on Paula Boggs Band.